This Spiked Sherbet Frappe Punch with fun rainbow sherbet is a beautiful Smirnoff pink drink perfect for Bridal Showers all summer long. In a large punch bowl, whisk together pineapple juice, limeade and pink lemonade concentrate. Next stir in lemon lime soda and confectioner's sugar until sugar dissolves. 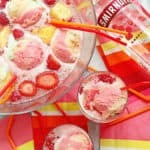 Whisk in Smirnoff Raspberry until everything mixes together. Toss in fresh raspberries, pineapple chunks, and strawberry slices. Lastly add scoops of rainbow sherbet to punch and serve immediately.